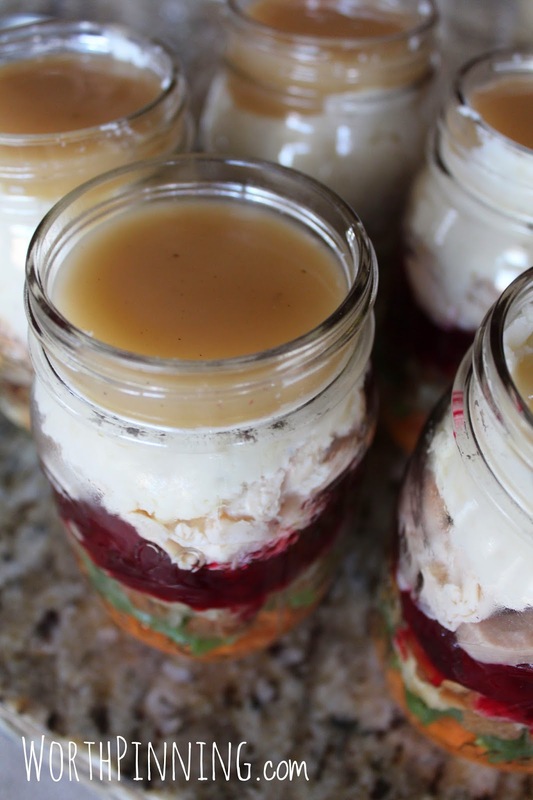 The next best thing to Thanksgiving is Thanksgiving leftovers. What if you travel somewhere else for Thanksgiving and have to leave empty handed? No leftovers?? 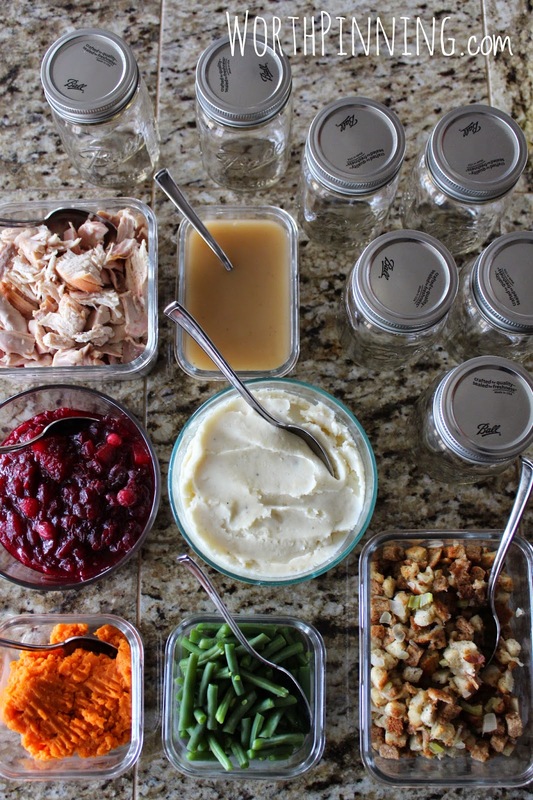 Not crazy about sending your Tupperware out the door with your guests? 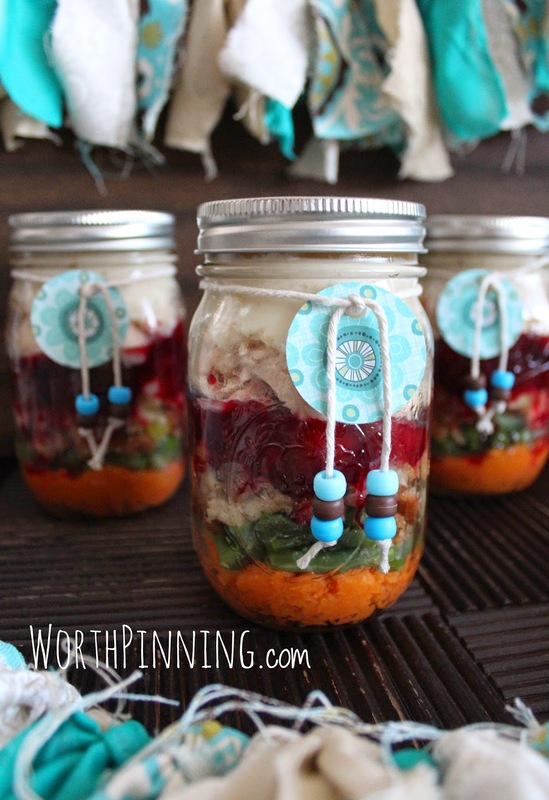 If you're hosting Thanksgiving dinner this year, grab a few supplies to send your guests home with their own Thanksgiving Dinner in a jar. We saw this idea in a commercial on Cooking Channel over the weekend and my daughter jumped up and said, "We HAVE to make those!" First, turkey dinner for the 1st weekend of November. Now, the leftovers. 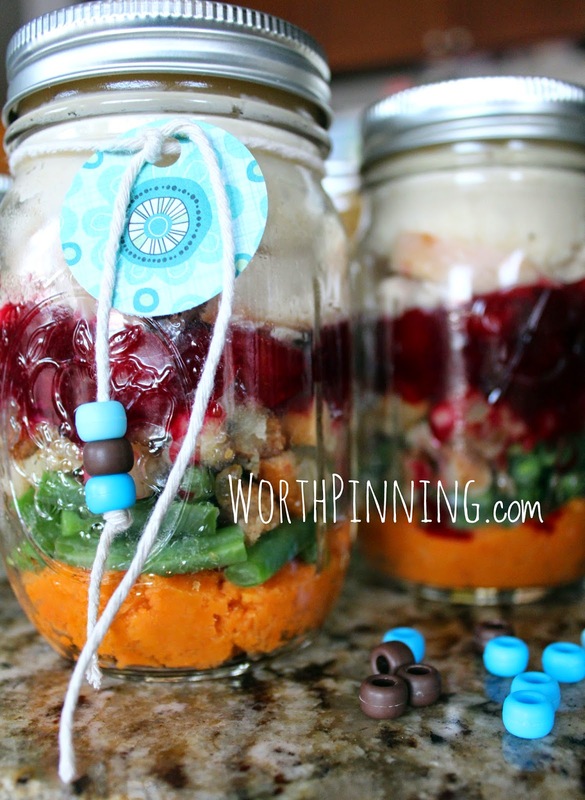 Layer the sweet potatoes on the bottom of the jar. 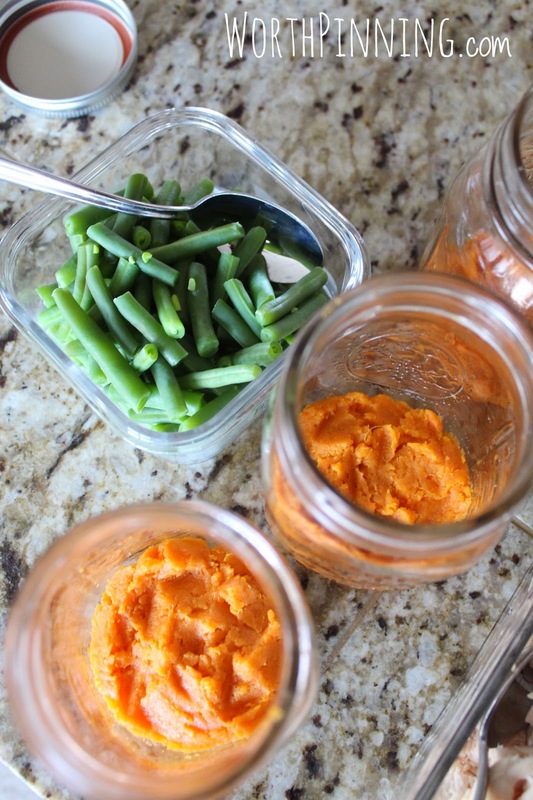 I made a few jars without sweet potato. 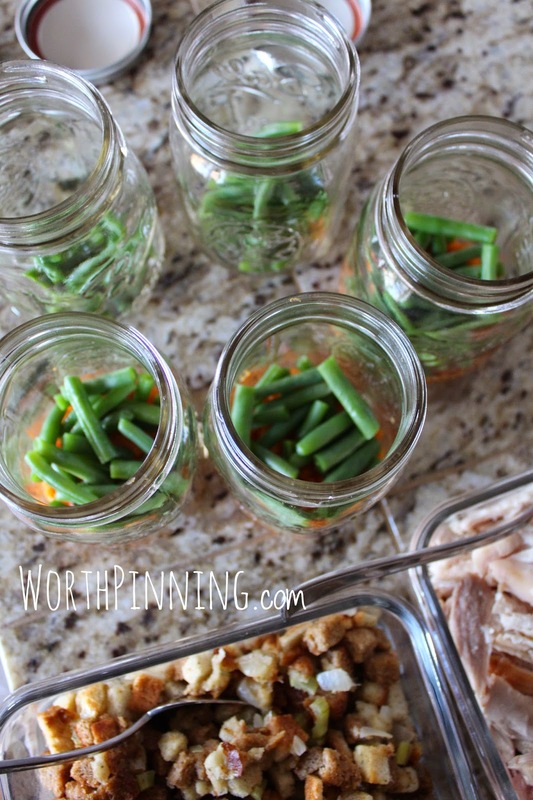 Next, layer the green beans. These green beans were steamed and sprinkled with pink Himalayan salt. Now, layer the stuffing. 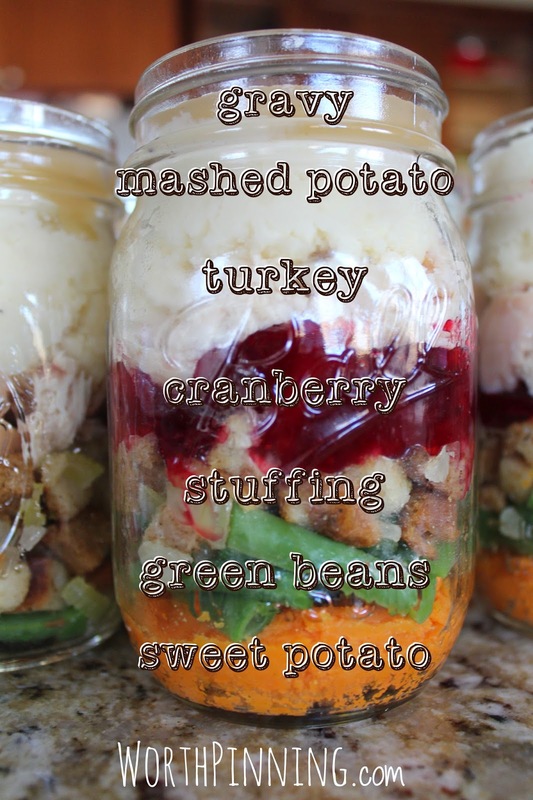 Our family favorite is the green package of Pepperidge Farm stuffing mix. Next layer comes the cranberry sauce. 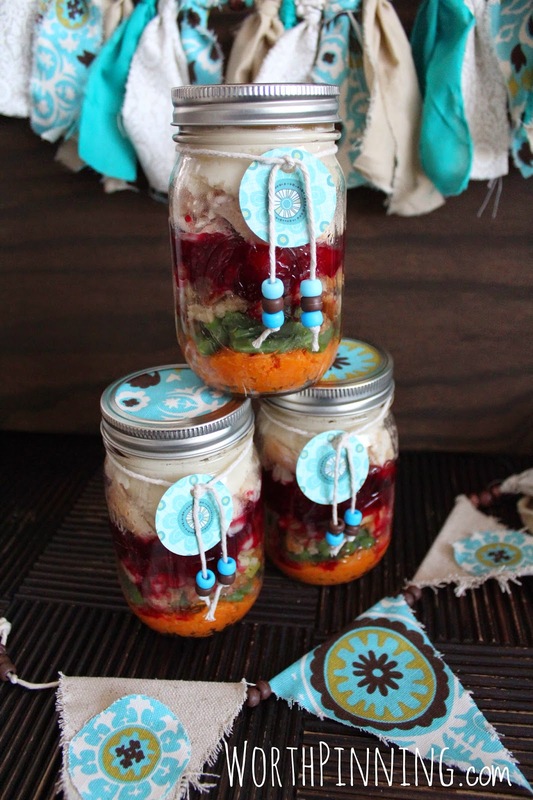 Here is the recipe for my chunky apple cranberry sauce. I used agave and organic maple syrup to sweeten instead of sugar. Top with mashed potatoes and gravy. The tags were quick and easy. We used a circle punch, fabric, twine, scrapbook paper and beads. Cut a round piece of fabric to place between the lid and band. 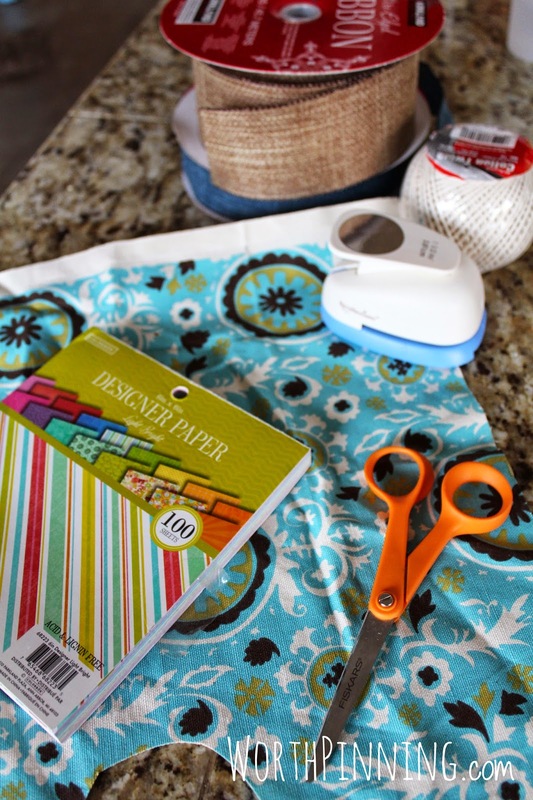 Hole punch the scrapbook paper circle cutout and tie to the jar. Finish with colorful plastic beads. The jar decorations match our Fall decor in the house. 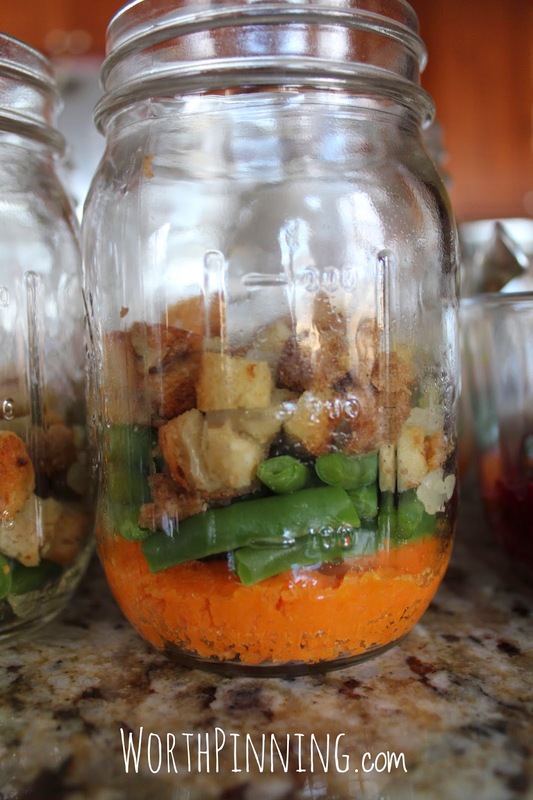 Re-heat and eat straight from the jar or empty the jar onto a plate. 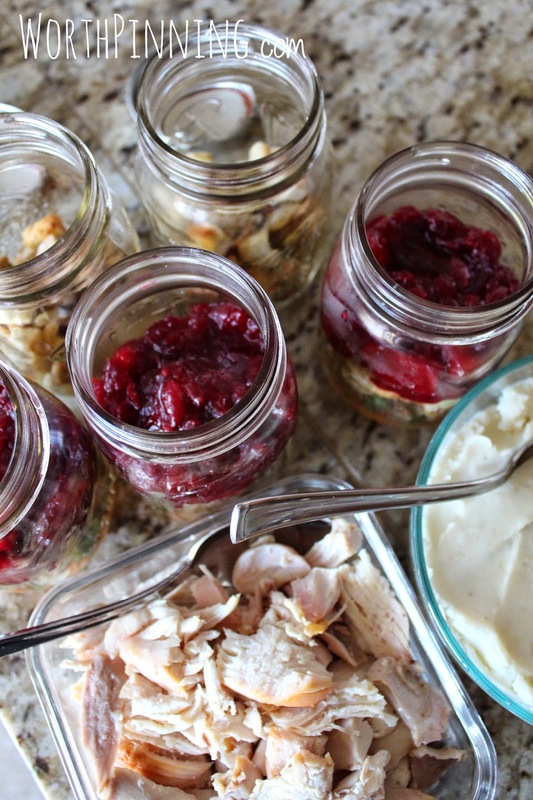 I also made some jars without the turkey since the sides will last longer as leftovers. Sans turkey is also a vegetarian option since the stuffing is made with vegetable broth instead of chicken broth. My mom is traveling, so we took a couple of jars over to my dad for dinner and lunch tomorrow. 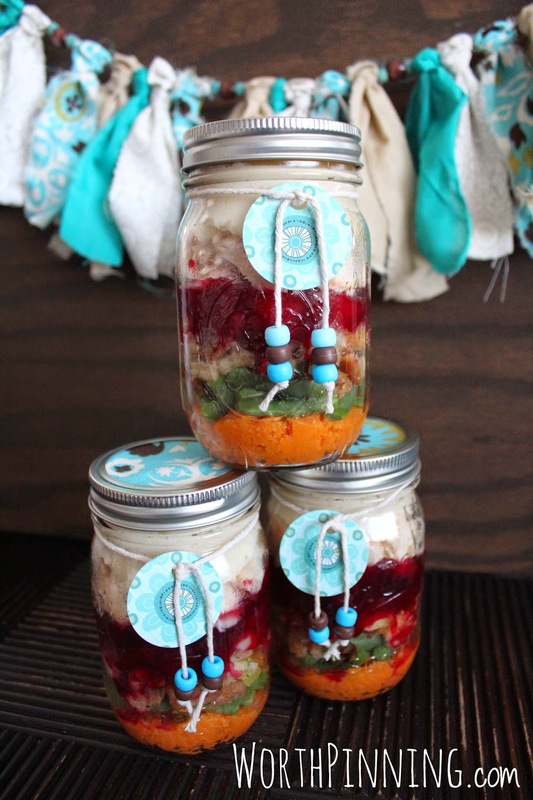 The other jars will go with the kids to school for lunches this week. 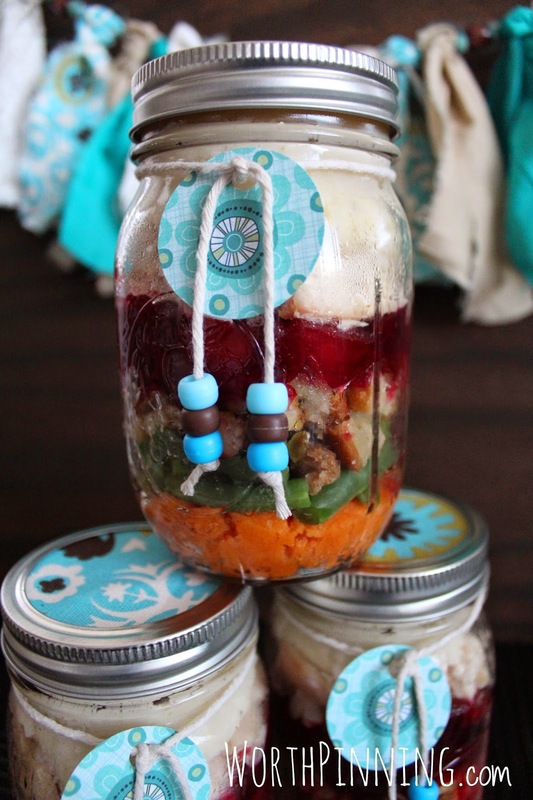 We will definitely make other versions of these leftover jars for school and work lunches. 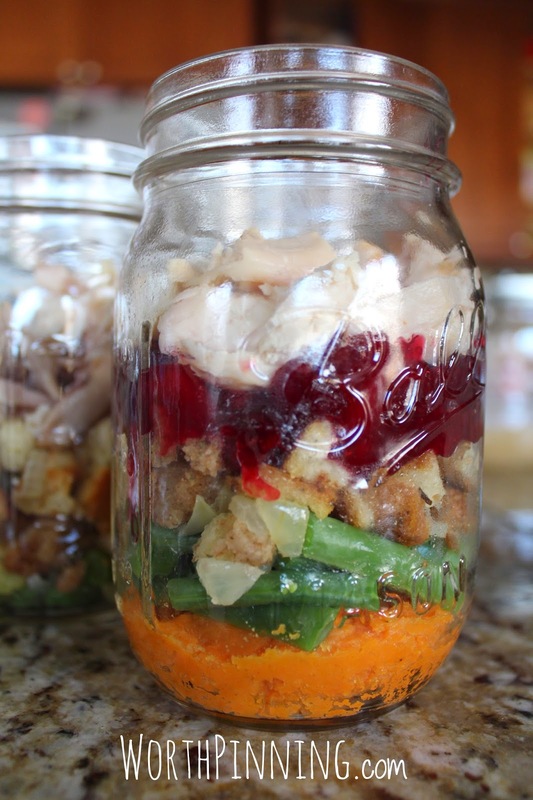 Hey family, I'll bring the leftover jars to Thanksgiving this year!